Use "beefcake" version. Tried my hand at designing mount to put this on quadcopter. 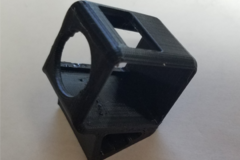 Printed one from thing repository, but it didn't have enough angle and seemed to interfere with the rather easy to press buttons. Lightweight skin is probably too thin to offer much protection, used approximately same thickness as OEM hard mount. If mount is a little too loose, consider scaling ~98%. **Friend said original design was too flimsy. Added "beefcake" editions.